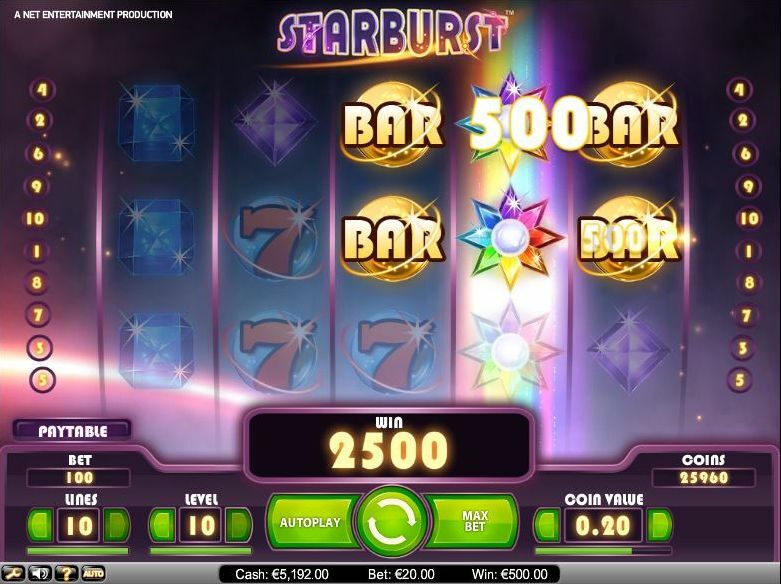 Starburst is a vibrant video slot from one of the leading casino software developer, NetEnt. It is a modern take on classic slots combining slick aesthetics and a clever soundtrack with simple arcade-style gameplay which can be enjoyed online or on mobile. The slot has 5 reels and 10 paylines which effectively doubles since you can win both ways, from left to right or right to left. You can play from as little as 10p per spin to £100 per spin and although the biggest win on the paytable is 250 coins, it is possible to win £50,000. Starburst is almost unique among video slots as it only has one feature, Starburst wilds. The wilds expand over the entire reel on reels 2, 3 and 4 and will re-spin whenever you get a new wild – up to a max of three re-spins. It means there is little interruption in spinning the reels due to bonus rounds, scatters or free spins. The action is relentless and this is perhaps one of the reasons it has become one of the most popular slots online. Visually, Starburst is a stunning video slot with beautifully lit jewels twinkling round the spinning reels and has a rich soundtrack adding an almost cosmic sensation to gameplay. Hit a winning payline and the screen explodes into life with a dazzling display of colourful light and sound – play in full-screen mode for the best visual effects. Before you spin the reels on Starburst video slot it is a good idea to become familiar with the paytable. This will give you an understanding of which symbols make up the winning lines. You can see this information with a click or tap the Paytable button in the bottom left of the screen. The biggest wins are earned from the BAR symbol which pays 250 coins for a combination of four symbols from the leftmost reel or in the other direction from the rightmost reel. The paylines are mapped so you can see the 10 combinations which make up each payline. Sliders allow you to adjust your bet stake which update in real time as you set the coin value, bet level and number of lines. You can choose from seven coin values ranging from 1p to £1 and stakes can be increased further by adjusting the bet level from 1 up to 10. The number of paylines can be set anywhere from 1-10 and the screen displays the active paylines as you make the adjustments. The Max Bet button will automatically set the number of paylines and bet value to 10 but it’s important to remember to set the coin value before you bet, as the cost per spin will be 100 times the coin value displayed. Various game settings can be adjusted to your personal taste with four icons located in the bottom left of the screen. The spanner icon is used to control on/off options for graphics display, audio settings, keyboard control, and features such as quick spin, animations and intro screen. The question mark opens the help menu and the volume can be altered via the speaker icon. The Auto button allows you set the number of spins to be executed when you press Autoplay and has advanced options to control when to stop the feature. To begin playing the slot, click the green button with white arrows in the center or hit Autoplay if you don’t want to click for each spin of the wheel. Starburst video slot can be found on almost every NetEnt software casino due its immense popularity. The fact that it’s such a popular online slot is reflected by the number of casinos which feature Starburst in their welcome offer, giving no deposit free spins or extra free spins with your first deposit. The game itself doesn’t have free spins and there is only one feature, Starburst wilds. Big wins up to 50,000 coins are possible due to the expanding wilds and because the reels are stacked. Mostly, you’ll be playing for smaller prizes which can come fast and frequent given it is a low variance game with decent return to player (RTP). Starburst is simple and fast, making it a great game if you want to hit the wagering requirements before drawing down bonus winnings. Is Starburst the right slot for you? 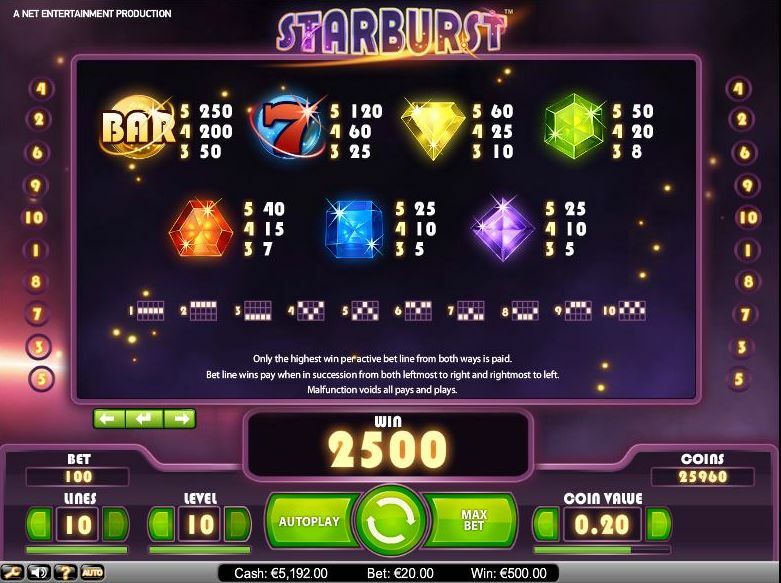 Starburst slot is a low to medium variance game rewarding players with regular wins which tend to be on the lowish side. It is possible to land some big wins on Starburst if you are fortunate enough to capitalise on the expanding wilds which stack to increase the potential number of winning lines. As stated above, the maximum payout is £50,000 which is a reasonable casino reward but not the life-changing amounts that can be won on other slots. The RTP is 96.1%, giving the casino a house edge of 3.9% which is quite good for an online slot. Like any slot, Starburst has the potential to eat through your deposit but on balance should provide reasonably lengthy play and is better suited to the player looking to while away some time with a modest deposit rather than chasing a multi-million pound dream. When it comes to fun, Starburst is a gorgeous experience but lacks the involvement of bonus rounds and other cool features that change up the gameplay.